Taylor Swift was the big winner Tuesday night at the 2018 American Music Awards, taking home the prize for Artist of the Year. Swift also tour of the year and best pop/rock album, and broke the record for most wins at the AMAs by a female artist. While accepting the prize for Artist of the Year, Swift got political for the second time in less than a week when she urged her fans to vote in this year’s midterm elections. Though the ceremony, at the Microsoft Theater in Los Angeles, wasn’t particularly political, the upcoming election did get mentioned a few other times. Host Tracee Ellis Ross came out wearing a t-shirt that read “I am a voter” midway through the show. And later, Billy Eichner implored young people who believe in “equality for women, for people of color, for the LGBTQ community” and who “believe climate change is real” to vote in “the biggest election of our lifetime,” while he and Kathryn Hahn presented an award. Other winners included Cardi B, Country singer Kane Brown, and Post Malone. See the full winners list below. See the full rundown of winners below. 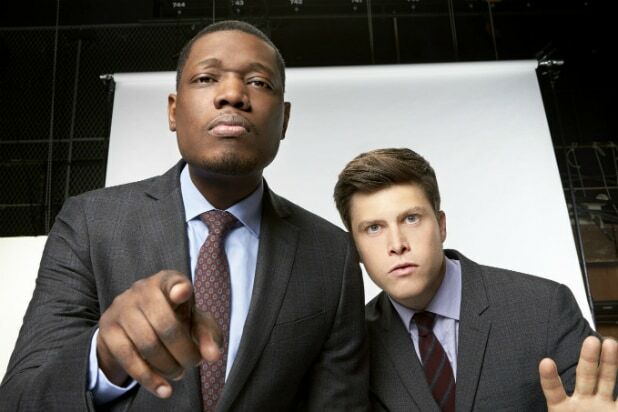 Because they co-host the “Weekend Update” segment on “Saturday Night Live,” it makes perfect sense for Colin Jost and Michael Che to host the 70th Primetime Emmy Awards together on Sept. 17. But over the last 20 years, this will be only the third time the Emmys have used more than one host, even though two or more hosts were the norm in the show’s first half-century. Here are 10 other notable hosting teams, some that make perfect sense and some that don’t. Lucy and Desi were clearly the first couple of television in its early days, so it was natural that they’d be co-hosts only the fourth time the Emmys were handed out – a show on which their show “I Love Lucy” also won the top comedy award. Why three hosts? Because the 1962 show took place simultaneously in three locations: Los Angeles (Newhart), New York (Carson) and Washington, D.C. (Brinkley). Sinatra handled the L.A. show, Van Dyke the N.Y. one, and they had one thing in common in 1968: They both barely survived a snafu-ridden Emmys show. Mary Tyler Moore had been a TV icon for more than a decade, and the night she hosted in 1976 her show would win five top awards. So why saddle her with a country-pop singer who was criticized for saying “far out!” too much? Only the TV Academy knows. Allen famously hated rock ‘n’ roll; Clark popularized it on “American Bandstand.” But they were both TV icons, so that was good enough. By the standards of the time, “Saturday Night Live” cast member Murphy and “Tonight Show” regular Rivers were pretty rude and transgressive comics – and they didn’t disappoint on Emmy night, delivering the bawdiest (and, some thought, most offensive) Emmys ever. Letterman was only in his third year as a late-night host, while Long was already on her fourth nomination for her role in “Cheers.” But the show was on NBC and they were two of the network’s biggest stars, so they became co-hosts. Bergen played a Pauley-like newswoman on “Murphy Brown,” and Leno was the change of pace in the middle of a three-hour show in which each of the hosts handled duties for an hour. Alexander was in the sixth year of the comedy series “Seinfeld,” Shepherd in the first year of her series “Cybill.” One of those shows would go on to be iconic, and the other wouldn't.